The National Snow and Ice Data Center (NSIDC) in Boulder, Colorado recently announced that the sea ice of the Arctic Ocean region had reached its annual minimum, which is the lowest extent after melting all summer before the ice begins thickening and rebuilding for fall and winter. This year the amount of ice at the end of the summer was the third lowest on record—1.84 square miles (4.76 million square kilometers). About a week later, the center updated its report to say that the ice had continued to melt (after appearing to begin its winter recovery). In total, scientists estimate there remained 1.78 million square miles of ice following the 2010 summer. The remaining ice in the Arctic is younger and therefore thinner than the ice generally is at this time, according to a more in-depth analysis from NSIDC. In short, in addition to decreasing in area, the ice is also diminishing in volume. Older ice tends to be thicker than younger, one- or two-year-old ice. This is significant because thinner ice is more susceptible to environmental changes, according to the analysis. Should next summer be as warm as this summer, the level of melt could be great. Last winter, the wind patterns associated with the negative phase of the Arctic Oscillation transported a great deal of multiyear ice from the coast of the Canadian Arctic into the Beaufort and Chukchi seas. Scientists speculated that much of this ice, some five years or older, would survive the summer melt period. Instead, it mostly melted away. At the end of the summer 2010, less than 15 percent of the ice remaining the Arctic was more than two years old, compared to 50 to 60 percent during the 1980s. There is virtually none of the oldest (at least five years old) ice remaining in the Arctic (less than 60,000 square kilometers, or 23,000 square miles, compared to 2 million square kilometers, or 722,000 square miles, during the 1980s). Whether younger multiyear ice (two or three years old) in the Arctic Ocean will continue to age and thicken depends on how much of that ice stays in the Arctic instead of exiting into the North Atlantic through Fram Strait whether the ice survives its transit across the Beaufort and Chukchi Seas or instead melts away. 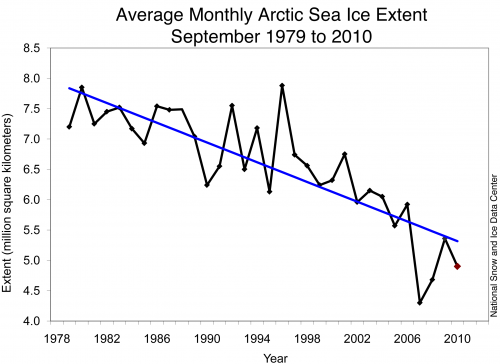 Since NSIDC began satellite measurements of sea ice extent, the trend in the Arctic has been one of decline. Click on this video Arctic Sea Ice Decline to watch a movie of annual maximums and minimums. For the first 12 years, sea ice melt was usually followed by a recovery. But in 2002 the sea ice minimum fell to a then-record 2.3 million square miles, more than 66,000 square miles below the previous low. It failed to rebound in 2004. In 2005, sea ice extent fell to another low, 2.15 million square miles, and then, in 2007, it underwent a massive drop, to 1.65 million square miles, the lowest yet.